DataSunrise Security Suite for MongoDB is an effective tool created to defend MongoDB databases proactively against malicious actions and internal vulnerabilities. The solution employs efficient threat detection algorithms which eliminate threat and keep corporate data safe. MongoDB firewall by DataSunrise is a high-performance solution designed for all-round protection of databases from outside threats and inside vulnerabilities. It continuously monitors and filters database traffic and blocks queries that meet predefined security rules. It defends information against malicious attacks, prevents intentional and unintentional data leaks, and detects early signs of data breach preparations. DataSunrise also ensures that organizations successfully stay compliant with industry standards and regulations, and maintain the required level of information security. The firewall immediately notifies database administrators in case of detecting suspicious activity or signs of a security breach. 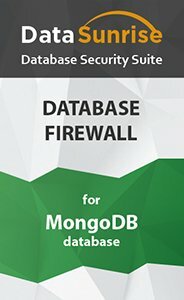 DataSunrise fully controls access to MongoDB, but at the same time does not compromise security of data, because it does not keep any sensitive information, like passwords. DataSunrise is deployed as a proxy - the firewall resides between database and clients and performs real-time tracking of user activity and changes made to database contents. It audits, logs and filters incoming and outgoing queries. Filtering decisions are performed based on administrator-defined security policies. DataSunrise Database Firewall runs on Windows and Linux and supports MongoDB 3.4.1.